Egg farms produce many choices of eggs - brown or white, conventional or cage-free, specialty eggs and various sizes. 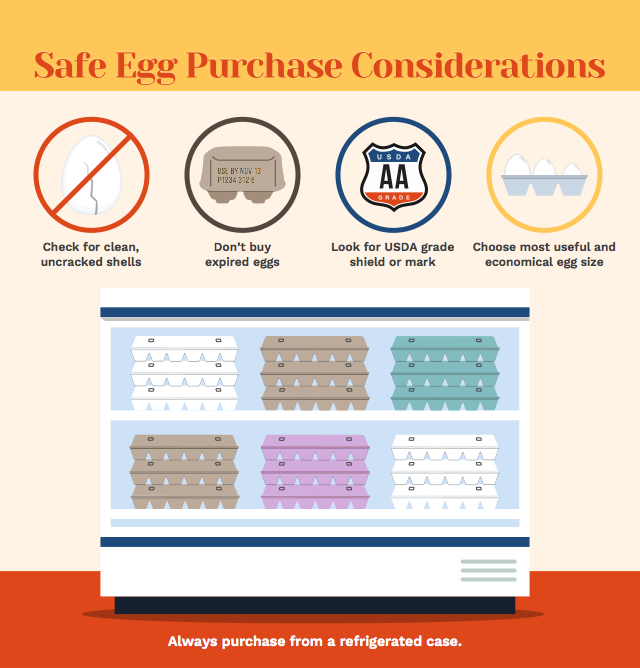 Regardless of egg type, follow these steps when purchasing eggs to ensure they remain safe. Consumers have many choices for fresh eggs. Learn about labels on egg cartons. Always purchase eggs from a refrigerated case. As the “refrigeration required” label states, eggs must stay cold to prevent bacteria growth. After eggs are refrigerated on the farm, they are stored and transported at an ambient air temperature of ≤45° F.
Open the carton and ensure no eggs have cracked, because bacteria can enter through cracks in the shell. If eggs crack on the way home, they can be safely used with some handling precautions. Two dates can appear on egg cartons, the Julian date and the sell-by date. Always purchase eggs before the sell-by or expiration date. When kept refrigerated, fresh shell eggs are safe to be consumed four to five weeks beyond the date they were packed, which is the Julian date found on the carton's short end.